So he ends up fighting a savage, brutal alien with Earth's fate in the balance (a la the famous Marvel Two-in-One Annual #7). He finds it is very difficult to defeat a foe who is not only strong and skilled but also not required to lose in the end, and he loses hope at one point, which leads to an intervention. Things take a turn for the better when he is visited by the League of Badasses, comprised of Theodore Roosevelt, Ben Franklin, and Chuck Norris. The trio inspire Ricky to get his act together, and I will not totally spoil things, but things end up all right. As I hope you can tell from the brief excerpts, this book is funny, thrilling, and just about the most awesome thing I have read in the past month. The art is simple and expressive. The dialogue is sometimes profane but full of hilarious phrases and interesting situations. This book was a surreal tale told in an incredibly entertaining manner. In case you don't want to just take my word for it, Robot 6's Caleb Goellner also liked it and called it "fun and funny wrasslin’ action that anybody can feel good getting bodyslammed by." I got this book at HeroesCon, and it was funded through a Kickstarter campaign. I have read it a few times now, as well as a bunch of mini-comics from its author, Kyle Starks. He has a bevy of free comics on his website, including the also super-fun Adventure Wizard and the somewhat philosophic Punch Captain. 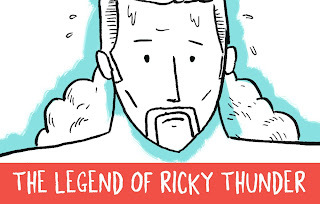 You can learn more about his work and his inspirations for Ricky Thunder in this War Rocket Ajax podcast. Also, Starks got a great write-up in USA Today. The whole story is available for free here in webcomic form. I bought it from the author at the convention, and I think he is a super friendly and talented man. I don't see links for buying a hard copy, but I am sure if you contact him directly he'd be glad to sell you one. 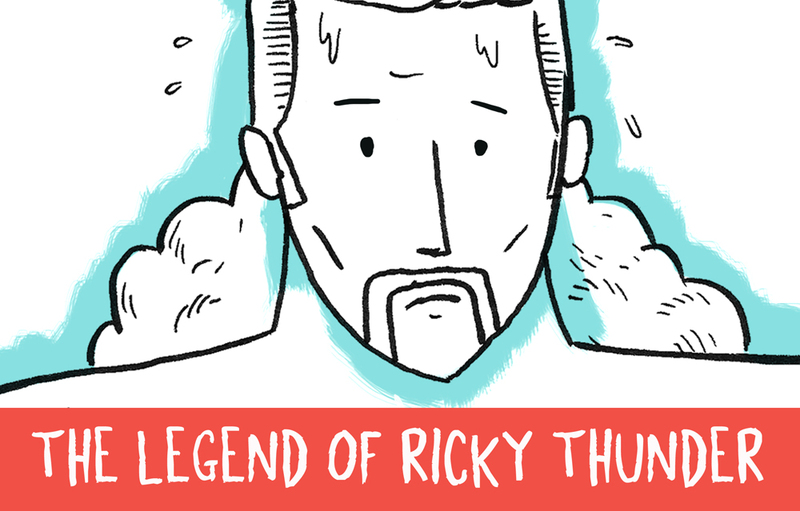 The Legend of Ricky Thunder brought me a lot of joy. It is a great book to share with others, even if they are not pro-wrestling fans, and I hope that you check it out. Totally cool postcard I bought from the author, Kyle Starks! 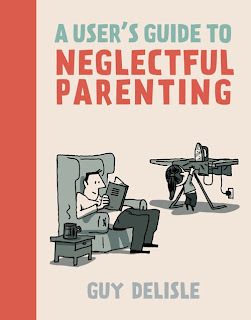 A User's Guide to Neglectful Parenting is a short and hilarious collection of parenting vignettes. I am quite familiar with Guy Delisle's work on travelogues such as Pyongyang, Shenzhen, and Burma Chronicles, where he is quite serious and excellent at observing and reflecting on various countries and their politics. These books are available worldwide in multiple language editions. I had no idea he was such an excellent gag cartoonist as well. The format contains comics that show some questionable and often hilarious parenting situations. Delisle is muddling through parenthood, and he is by no means a perfect authority figure, but he owns his foibles. As a father, he seems very idiosyncratic, alternatively honest and duplicitous with his children. He offers them advice and information, with the intention of being helpful, but sometimes he comes off less than favorably. Still, these words are very effective. Also, not at all horrifying. The artwork is relatively simple and iconic, and I think his background in animation shows in the straightforward storytelling. His story structure is masterful and relatively simple. Even when the tales move over the space of multiple pages he sets the reader up for different emotional beats and punchlines. Impressively, his stark linework conveys the warmth that comes from small, honest moments. Delisle might be a crappy dad sometimes, but he has love and concern for his children. He is trying his best as a father, I feel, and it is refreshing to see such humor and candor conveyed so clearly in an autobiographical comics story. Reviews I have read about this book echo the enjoyment and positive features I have described above. NPR's Glen Weldon called it "brighter and funnier" than his other work, and added that this book "shares with his previous work a keen appreciation for the clash of cultures; this time, however, the cultures in question are those adults and children, and the damage that ensues is played for a rueful laugh." Boing Boing's Mark Frauenfelder described it as "funny and truthful." Jeff Bouchard, "a father of two young children...found A User’s Guide to Neglectful Parenting to be relatable and a lot of fun," and he noted that you do not necessarily have to be a parent to enjoy it. A User’s Guide to Neglectful Parenting was published by Drawn & Quarterly. There is a sizable preview at Publishers Weekly. Boy, have I been reading a bunch of violent superhero comics lately. I need to cleanse my reading palate , and luckily I happened upon this volume at my local used bookstore a couple of weeks ago. Little Archie with Abercrombie. Or is it Stitch? These stories are not all that deep, but they are fine adventure stories that are funny and very human. They depict and define Archie's hometown Riverdale in ways unseen in other comics. They also range in great sweeps from silly robot humor to slapstick tumbles to high adventure. There are some amazing sights in this book including a huge gorilla, an alien world, a giant crumbling dam, pirates, dinosaurs, and Little Archie wearing a bushy mustache as a disguise. Personally, I liked the nature adventures best, but there are no clunkers in this volume. These stories were notable in the 1960s for their artistry, and even though credits were not given as often in those days, readers did take note of the craft and style of Bob Bolling, who was allowed to sign his name to these comics. He was a notable and influential artist, as you can read about here. He had a long career at Archie writing and drawing stories about him as a child and a teen. A great appreciation of Bolling, his stories, and his art from Jaime Weinman can be found here. A couple of Bolling's Little Archie stories can be found here. 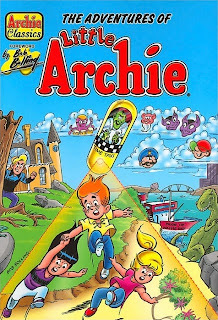 The Adventures of Little Archie is published by (who else?) Archie. 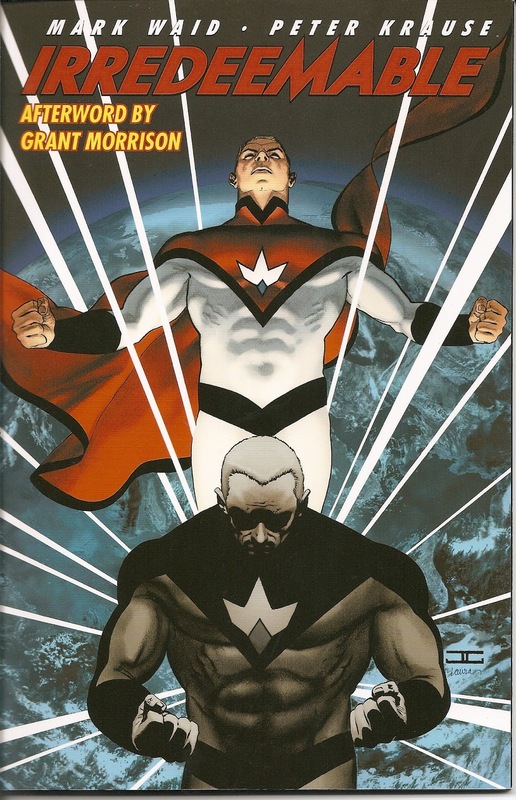 Following my disappointment in reading Hell Yeah, this series Irredeemable shows a great way to tell a superhero story that is simultaneously familiar and novel. The concept appears simple at first glance: What would happen if the world's greatest hero suddenly became its greatest villain? The supporting cast also has many Super-analogues, such as a complicated triangle between his superhero identity, his secret identity, and a girlfriend he works with (a la Superman and Lois Lane - their relationship has its own Wikipedia page. It's that complicated!) and also a younger sidekick who is privy to many secrets named Samsara, a kind of immortal Jimmy Olsen. However the superteam that he belonged to and that becomes his adversaries, The Paradigm, is full of more unique characters such as the twins Scylla and Charybdis, the brainy Qubit, and the markswoman Bette Noir. Their powers are familiar but their characterizations are interesting and fresh. What has set off the Plutonian's change is unknown, which makes for a good mystery, but the book also delves into some pretty dark places in terms of action and also psychological horror. For instance, The Plutonian utterly decimates an island nation because it only agreed to bow to his rule because it feared his wrath. Adding to the horror of this moment, before he completes the deed, he makes his former teammates make a terrible choice to prove a point. This book is the creation of Mark Waid and Peter Krause. Waid is a long-time, award winning comics professional who has written many comics for multiple publishers, including notable runs on Daredevil, Superman, Captain America, The Fantastic Four, as well as the well loved mini-series Kingdom Come. He also is heading the e-comics enterprise Thrillbent. Krause has worked in comics for decades as well and is known for his work on Superman, Shazam, and Star Trek. Waid speaks more about this book and series in this interview with The Graphic Novel Reporter. Both creators speak about their work in this audio interview from 2010. I found this volume a great introduction to a ripping superhero yarn. The art is clear and above par in showing two worlds: a colorful, bright past and a dark, murky, and fearful present. This narrative is built on some typical superheroic conventions but spun in interesting ways. As can probably be seen by now, this book is pretty dark in tone, as The Plutonian is completely brutal and ruthless, so it might not be for everyone. I have read a few more volumes into the series, and I have found it a substantive and satisfying read so far. 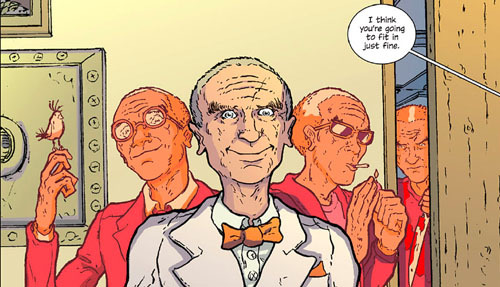 This series received many accolades when it debuted, including multiple Harvey and Eisner Awards. Reviews I have read have been positive. Ana from The Book Smugglers praised the book for its rollicking plot, crisp art, and cliffhanger ending. David MacMillin gave it 8 out of 10 stars. Andy at The Geeks of Doom called it "an exciting epic designed to keep you coming back for more." Irredeemable is published by Boom Studios. A brief preview of the first pages of the book is available here from Comic Book Resources. 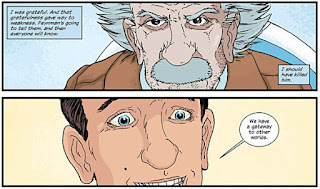 I felt that the revival of Glory was one of the best comics I had read last year, so when I saw that the author Joe Keatinge was writing another series, I was all in for this book, especially after I read an intriguing preview of issue one on my Kindle Fire. This series follows the adventures of Ben Day. He is the son of a first generation superhero and wants nothing to do with the super powered folk at all. He ends up getting into Kurtzberg University because of his parents' connections, and despite his superpowers and advantages he keeps putting himself into bad situations. Destruction and confusion follow in his wake, and everything gets complicated when he meets a woman who says she was his girlfriend in an alternate dimension. It turns out that various versions of him are being murdered across the multiverse, and different versions of him keep coming to this universe where they frequently come to brutal and bloody ends. Yes, that guy looks like Gary Oldman playing Commissioner Gordon for some reason. Hey ladies, check me out! No literally, you can. Because I totally have a bar code. and lots of people are interested in locating him, either alive or dead. It appears that he is somehow pivotal regarding all of the superheroes. Honestly, after the thrill that Keatinge's revival of Glory was for me, this series left me pretty cold. The strength of The Manhattans Projects is the weakness in Hell Yeah. I get that this book seeks to create its own superhero universe and that it plays with ideas and concepts that are hallmarks of the Big 2 comics publishers, particularly DC, with multi-dimensional teams of Ben Days that resemble Bat-Mite, 1990s extreme superheroes, and other alternate takes on character designs. But in the end, to me, these just seemed derivative and largely empty. Much of this book relies on its visuals, but not much seems well thought out, explained, or realized, so in the end I know almost nothing about Ben, other than he seems very shallow and annoying, and hardly anything else about the other characters. What is worse, I am not sure I even want to know more about them. As a result, the mysteries are not so compelling or mysterious to me, the characters fall flat, and there is little other than some interesting visuals to make me want to keep reading. Perhaps it is supposed to be some meta-commentary about superhero comics, but I find the contents of this volume neither remarkable or insightful. The art is by Andre Szymanowicz, who has drawn a handful of books for DC Comics and Image, and it is serviceable though not outstanding. His grasp of anatomy is a bit wonky, and I am not impressed much by his layouts or gratuitous details (a lot of people spew saliva and every gunshot results in a wide splash of blood and guts). I can't tell if this style is intentional, in the manner of parody, or if this series is meant as some kind of metacommentary on crappy 1990s comics (a.k.a. low hanging fruit). If it is the former, then the joke is too decompressed to be funny, and if it is that latter, the story is taking far too much time getting to the payoff for me to care. All in all, when it comes to this book the sum is less than its parts. Reviews I have read about the book range from lukewarm to positive. Spartacus! from the Geeks of Doom noted that the book does feature some "obnoxious ’90s superhero comic book traits" (perhaps ironically? ), but it is "not clear what the stories trajectory is just yet." This bothers me as this is the first volume of a series and supposed to set the stage clearly. The reviews at Booklist and Publishers Weekly are more positive and generous, seeing more potential in this series. Hell Yeah is published by Image Comics. I have been enjoying Jonathan Hickman's run on Marvel's Avengers right now, and I have heard all kinds of good things about other comics he has written, plus I like reading about science, so I thought I would give this book a shot. I was glad I did. 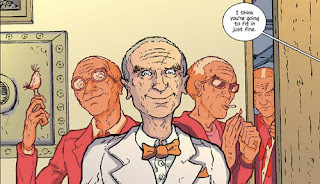 Science Bad is the first story arc from the ongoing series The Manhattan Projects. In this alternate history version of Earth, beating the Nazis is not the most important outcome of World War II, rather it was an era when a secret government project wrought amazing technical advances, including space travel, artificial intelligence, inter-dimensional teleportation, and contact with alien life. The main players are reconceptualized versions of some major figures, including Robert Oppenheimer, Albert Einstein, Richard Feynman, Enrico Fermi, and Wernher Von Braun. Moreover, these characters are not always what they seem. Many are conniving or insane or sociopathic. In all, without spoiling what goes on too much, I have to say that between the frenetically beautiful art and the twisting plot this book is an absolute winner. What is amazing to me about fictional universes like Marvel or DC is how sturdy, complex, and articulated they are, but they have the benefit of having been developed over a period of decades, under the watch of some talented and dedicated creators. In the space of the five chapters of this volume, Hickman pulls off an impressively similar feat, engaging in a fictional universe-building that is simultaneously logical, insane, intense, and clearly well thought-out. When he shows you a device, alien race, or seemingly random event, it fits into a whole. He has woven a complex kind of continuity that seems simple on the surface but which must have taken much time and effort to conceive. This book's creators Jonathan Hickman and Nick Pitarra are frequent collaborators and Eisner Award nominatees. Hickman is famous as a writer for a number of series, including his own The Nightly News as well as flagship series for Marvel such as The Fantastic Four and The Avengers. Pitarra has also drawn the limited series The Red Wing. His artwork here is kinetic, gross, darkly humorous, and incredibly detailed. All the reviews I have read about this book have been full of praise. David Fairbanks gushed, "if you haven't been reading this amazing series, you should be grabbing this trade, canceling whatever you were planning to do, and burying your nose in it until you're done." The reviewer at Guys Lit Wire wrote, "This book is insane," and also commented that "I'm not sure how this is going to sustain as a long term series, but it's quite a fun ride at this point." Dave Buesing called it "a fantastic blend of historical truth and completely insane fiction." I am not sure if this series is for everyone or if it would play as well to someone who did not have a knowledge of the main players in this series. Still, I think it plays like a tightly plotted, sober version of Men in Black populated with calculating, sinister scientists. I enjoyed this initial offering very much, and I will be getting later volumes for sure. 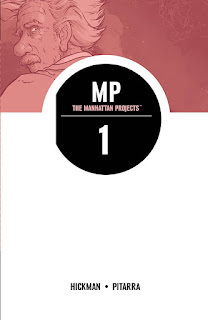 The Manhattan Projects is published by Image Comics. They provide a brief preview here. No, you did not read that wrong. Today is Independence Day in the US, and many folks are celebrating with barbeques and fireworks. I am celebrating it also being the time when summer school is over, and I can catch up on my "fun" reading. So for this month, I am only posting about books that I have read because I just wanted to. They are about superheroes, adventurous kids, professional wrestlers, and shady characters. They may or may not have so much application in any classroom setting, but they are (hopefully) good reads and a fun way to pass the summer months. I am also taking this time to catch up on all kinds of series that I have been missing out on. So grab some lemonade (that cool refreshing drink) or an iced tea (or something stronger if you prefer), and come back tomorrow to see what's in store!